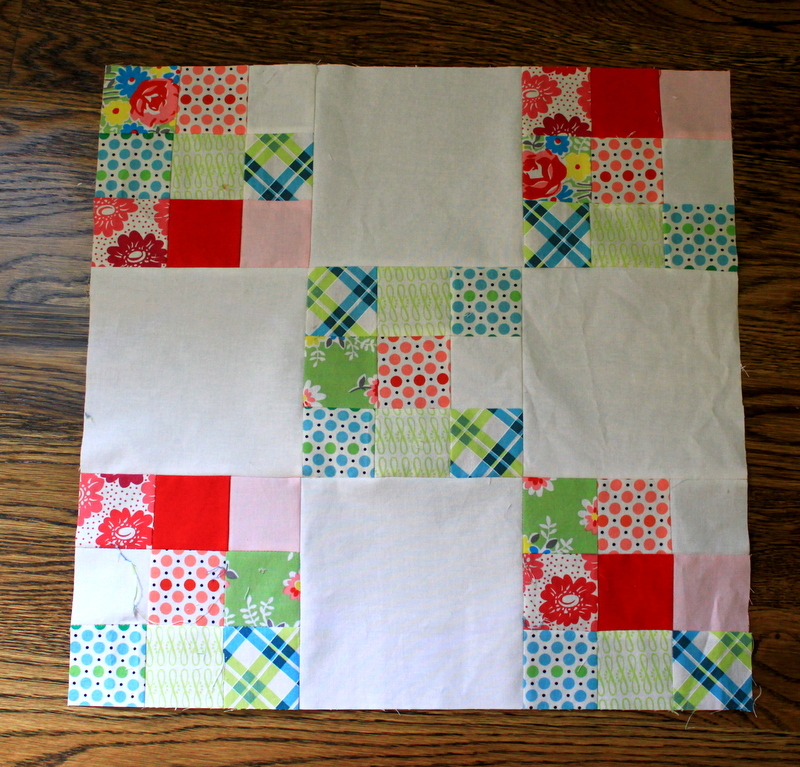 We used the tutorial from Sew, Mama, Sew’s Modern Block of the Month series to make this block. I love the end result of this block but the process was a bit strenuous. If I were making 12 inch blocks, it would have been no problem, but since I am making 18 inch blocks, the math became a bit sketchy. Deborah had posted an updated pattern for those of us using larger blocks but I messed up on some of the numbers and had to do some seam ripping and re-sewing. Math has never been my strong point! I think that if I ever make this block again, it will be much faster. However, the other thing I did not like about this block was that you end up cutting off quite a bit of fabric and, to me, that is somewhat of a waste. I do enjoy learning new skills though, and this block taught me some good math/block construction skills. I have always wanted to make nine patch blocks but never gotten around to it so I was happy that a block was included in this class. This block is a bit of a twist of the traditional nine patch because it includes large blocks of fabric in with the nine patch blocks. I had planned on doing a different layout, but as I looked through my fabric I realized that I had quite a few 2.5 inch strips left over from my Log Cabin and Rail Fence blocks- I even had a long strip already sewn together! I then decided to save time and use the fabrics already cut and combine them with a solid white Kona cotton to break up the scrappiness. I do so like how this turned out! I’ve completed 4 out of the 10 blocks for this quilt class and learned so much already! 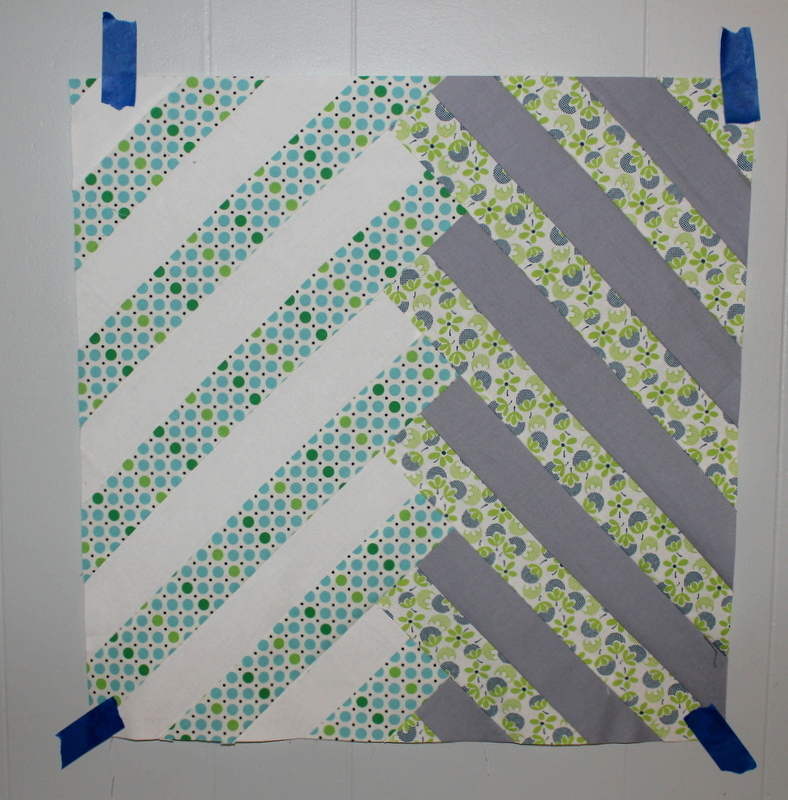 Next up, I’ll be working on some HST (half-square triangles) as I make a double pinwheel block. I have learned so much already from this class and can’t believe it is almost half over 😦 . Every day I can’t wait to log in and see what new block we are working on! Hopefully these blocks are inspiring you to learn some new skills as well! This entry was posted in Quilts and tagged double nine patch block, modern herringbone block, quilting class by oliver's fancy. Bookmark the permalink. I feel the same way every day around noon… I can’t help but peek at the website to see what I’ll be working on when I get home! It’s like a new surprise every day.